We are looking to build a 400-500sq ft ADU/Granny Flat on our property. We are in the county of San Diego and most lots in our area are 1/2 acre or larger. We have a large front yard with a level straight rv parking spot that we want to build. We got one contractor to check the setbacks and he said that about 2/3 of the ADU would be outside the setbacks. We thought the property line went all the way to the street but it appears that our property only goes to our fence. The rv spot is about 10ft from the fence so its pretty close. Our property also sits about 15ft above the street level so we may have some kind of exemption to build closer than the standard setback? The attached picture shows what the contractor gave us. He basically said that we could not build in the area we want to build. Does anyone know if they have loosened some of the laws in regards to setbacks and permitting? I know they are trying to encourage people to build ADU's so we are hoping that we can. Submitted by FlyerInHi on April 9, 2019 - 12:51pm. If your contractor said “no can do” then that’s pretty much it. i suggest you make an appointment with the county planning department and talk to a planner. You may be able to ask for a variance. But there are costs associated, and if the variance is denied, you have to eat the costs (architecture drawings, etc..). Ultimately you can appeal to the County commission or go to court, if you believe you have a case. Submitted by Hobie on April 9, 2019 - 3:42pm. I would first get your place surveyed. Submitted by rent4now on April 9, 2019 - 4:27pm. What would be the best way to go about getting the place surveyed? Also what would be the benefit of getting that done. I just talked to another contractor that said he maybe able to get an exception because of the property being above the street level. Submitted by Hobie on April 9, 2019 - 6:02pm. Sometimes, property lines are not where they 'should' be. Visit the planning dept. They will show you on their maps the general property line. If you are close to correct setbacks, then you need to be exact and thus, call a surveyor. Any chance of loosing the driveway turnabout? That seems like you might gain the necessary distance. Plus, your diagram need to show full lot and existing structure. 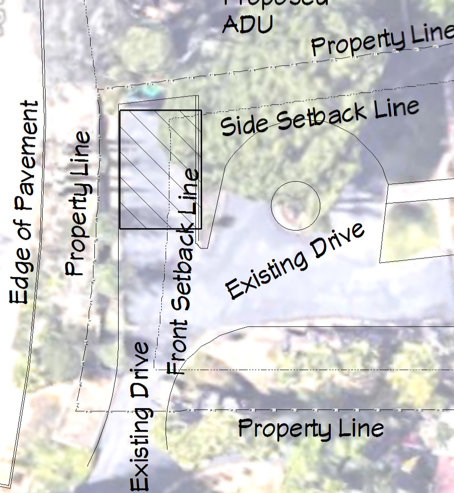 Maybe you could pursude city to consider the front yard set back where your driveway enters from the south, instead of the east. Long shot, but worth a try. Submitted by SDNative2 on April 9, 2019 - 7:48pm. A survey is definitely the first step of your due diligence (I used Kappa, but I'm sure there are many other great companies out there.). Pay to have extra stakes put in. You'll likely pay anywhere from 3K to 10K for the whole survey package depending upon lot size. I discovered my neighbor had built the fence two feet over the property line into my yard, for 150 feet! Those extra 300 feet made the difference between being able to build 2 or 3 units in my City of SD property. My property line also went out INTO the street 10 feet deep from a 1940s City dispute, so I also gained footage there. Also, get SDG&E and your Water dept. to each come out and mark what they can mark (sewer lines, elec lines, etc.). Go to their offices and make copies of any and all maps available. Go to the County--the assessor has a few documents for each property. You didn't mention a septic field, but I'm assuming you don't have that problem. Go to your nearby school district--they should have maps going way back, and if you're anywhere near a school, your property WILL be on their maps and you can get a copy. If you're the first survey in your area and they have difficulty finding other survey points (forget what they're called), any data you can provide will help your surveyor set precedence for your property's location. Submitted by FlyerInHi on April 10, 2019 - 9:50am. Remember that there’s a process to getting a variance and it’s not free. You can pay someone to do it for you. I agree with the other posters — do your own research on your lot. Then you may decide you want to pay for a survey. Submitted by moneymaker on April 10, 2019 - 10:56am. I would look for the survey markers yourself first. Typically nothing can be built within 5 feet of them. Also sometimes the property lines are wrong everywhere so you might gain footage in one direction but lose it in the other direction.